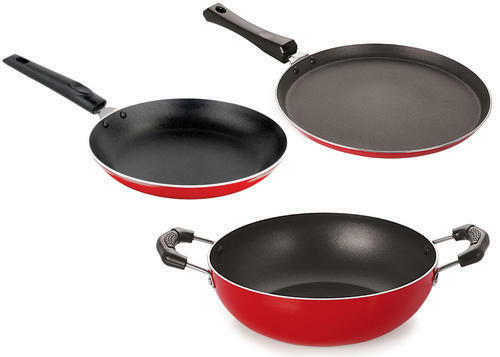 Nirlon nonstick cookware set provides an array of user-friendly features. Its innovative Nirlon Thermo-Spot heat indicator makes it easy to properly pre-heat pans, which helps seal in the flavor of food, whether sauteing or searing. The cookware's heavy-gauge aluminum construction heats quickly and offers long-lasting strength, while its even-heat base distributes heat throughout for reliable cooking results. Use the cookware on any cook top, except for induction. Recyclable and PFOA-, Lead-, and Cadmium-free, the cookware's durable nonstick surfaces-inside and out-offer effortless food release (little to no fat needed), quick and easy cleaning, and a healthier choice when it comes to cookware. While its ergonomically Bakelite handles offer a secure, comfortable grip.Premium Quality Nirlon Kadai Is Deep Vessel Height Is Useful To Cook All Type Of Food. Easy To Clean And Wash, They Have Very Exotic Silver Shining. Highly Durable And Made Of Fine Quality Stainless Steel. Used For Preparing Tea, Coffee, Boiling Milk & Cooking More Such Liquid Product. Used For Cooking More Food Compare To Frying Pan Due To Its Deep Vessel Height. Compaq Size Makes It Easy To Store In Kitchen Cupboards. When Not In Used Smaller Container Can Be Stacked Inside Bigger Container Saving Lot Of Storage Space. Switch To Healthy Cooking By Nirlon Kitchenware. Packaging Details Printed color boxes with master box . Owing to our vast experience and expertise of 21 years in this domain. We have been able to consolidate our position in the market by the Brand "NIRLON". We are among the eminent manufacturers, traders and exporters of Kitchenware such as Nirlon Aluminium Non stick Cookwares, Induction Base Non stick Cookware, Stainless Steel Vacuum Flask & Bottle, Gas Lighter, Gas Cylinder Trolley and Cleaning Aids Products. These are user-friendly and can be used in day-to-day lives. We follow strict norms when it comes to quality, which helps us consistently test products on various parameters like raw material used, design patterns, compressive strength, resistance against different weather conditions, finishing and durability. These are manufactured in compliance with the international standards. Owing to customized solutions and timeliness, we serve a vast clientele all across the Indian Subcontinent. Furthermore, we offer our products at market leading prices.